Summons are characters that Sora can call mid-battle if he needs help and has enough MP. Summons can be obtained by collecting various Summon Gems across the worlds, but are only available after you visit Traverse Town a second time. After Sora is introduced to Merlin, examine the coach in Merlin's house (a reference to Cinderella) and the Fairy Godmother will appear. Speak to her and, if you have a Summon Gem, she'll transform it into a character you can summon. It will be added to your commands under Magic and then Summon. This doesn't apply for every summon, however. Genie and Tinker Bell can be obtained by completing their respective worlds - no Summon Gems are required. After obtaining the Summon command, simply go to Magic and scroll to the bottom, where the Summon option can be found. After choosing that option, select the character you'd like to summon from the list of summons you found. You can only summon when you have enough MP (since it's a Magic command) and when both party members are present. You can't summon when Sora is fighting alone or when a party member is knocked out. After you have summoned who you want to, the chosen character will enter the battlefield in a short scene. A gauge will be in the top-right corner of the screen showing the summon's MP and Charge, with the latter only appearing if using Simba or Bambi. Use the first (for Dumbo and Mushu) or last (for Simba and Genie) option on the menu to allow your summon to attack. The MP bar represents the time the summon has left before it leaves and your party members return. It steadily goes down when the summon is doing nothing, and more MP is consumed when the summon attacks. Simba is the first possible summon you can obtain at Sora's second visit to Traverse Town. After speaking with Leon, he'll give you Earthshine. Bring the gem to the Fairy Godmother and it will transform into Simba. When Simba is summoned, before entering the battlefield, he roars on Pride Rock and then launches into battle. Simba attacks foes by roaring after charging power. When the Charge Up command is selected, Simba will begin storing power. The longer is held down, the more power he stores. When released, Simba roars loudly, damaging any enemies nearby. Genie, unlike Simba, is not obtained from a gem. The only way to obtain Genie as a summon is to seal Agrabah's Keyhole. As part of the story, Aladdin suggests Genie accompany the party on their quest and give them a helping hand. When Genie is summoned, sparks will fly out of Sora's Keyblade and Genie will appear on the battlefield. Unlike Simba, Genie doesn't require charging as he doesn't have a charge bar. All he has is an MP bar, which is consumed by using the Showtime command. 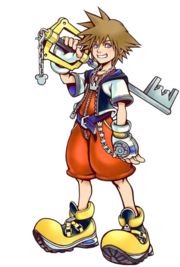 He fights by using magic beams he shoots from his fingers and using the magic commands Sora has already unlocked. Genie will only attack if you are locked on to an enemy. Dumbo comes from the Watergleam gem, which can be found inside Monstro. You'll be able to find it after Gepetto gives you the High Jump ability. Bring the gem to the Fairy Godmother and she'll turn it into Dumbo. When Dumbo is summoned, Sora jumps on his back as he flies around. You'll be able to control Dumbo from here by pressing to ascend and to descend. During the summon, Sora and Dumbo are invulnerable to enemy damage. You can attack the enemies back by using Splash. A jet of water shoots out of Dumbo's trunk and attacks the Heartless. Bambi comes from the Naturespark gem. This can be obtained after returning the first set of pages to the 100 Acre Wood. Bring the gem to the Fairy Godmother and she'll turn it into Bambi. Unlike other summons, Bambi doesn't attack. It's best to call him when Sora is running low on MP. When Sora attacks Heartless and gets rid of them, Bambi will prance around and drop MP orbs. The more enemies you defeat, the more MP he drops. If you defeat many enemies, he'll leap into the air and drop a special item like Mega-Potion or Elixir. Bambi can be summoned at the cost of only 1 MP. Tinker Bell, like Genie, is also obtained through the story. After sealing the Keyhole of Neverland, Peter Pan will ask Tinker Bell to accompany the party on the remainder of their quest. She will then become available as an option in the Summons Menu. She acts differently than the other summons, as she is an exception to the party member rule. Usually, your other party members exit the battlefield to make way for a summon, but when Tinker Bell is summoned, your allies remain on the battlefield while Tinker Bell performs her summon abilities. She is best to use when in need of HP, as she continuously heals Sora until she is dismissed. She will also revive Sora if he is knocked out. Mushu comes from the Fireglow gem. Defeat Maleficent in her dragon form at Hollow Bastion and you will obtain the Fireglow gem. Bring the gem to the Fairy Godmother and she'll transform it into Mushu. When summoned, you'll be able to use Mushu's Fire Breath attack by pressing to attack from a distance. Mushu's attacks will not damage enemies immune to fire. The cost to bring him in is 3 MP. This page has been accessed 152,861 times.